This February I had the pleasure to run Magic Judge Booth at Grand Prix Vancouver 2017. The experience was unlike anything I have ever done within the Judge Programme. 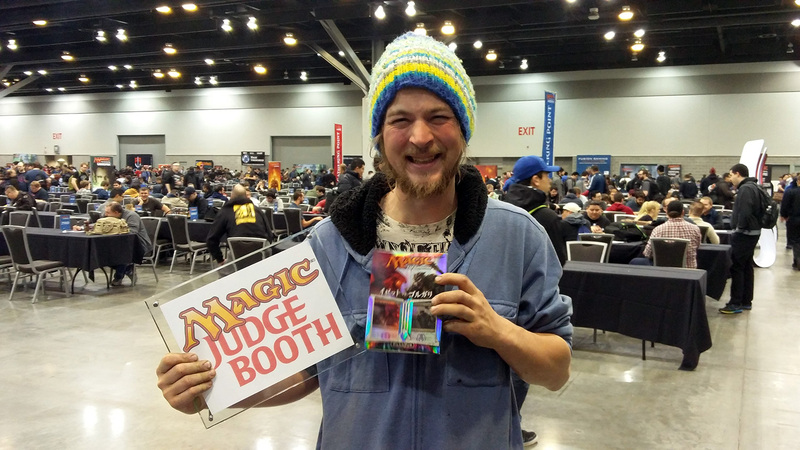 For those of you who are not aware of what Magic Judge Booth is I suggest checking out the Readme on the project page and checking out the great Web App. I would summarize it as a place where Magic Players can come and talk to Magic Judges outside the context of a Tournament or FNM setting. Judge Booth went off without a hitch. I had quite a few players come by the booth. It was awesome and the program worked really well in offline mode. I had my laptop to look at the answers and two tablets running Judge Booth for players to use. 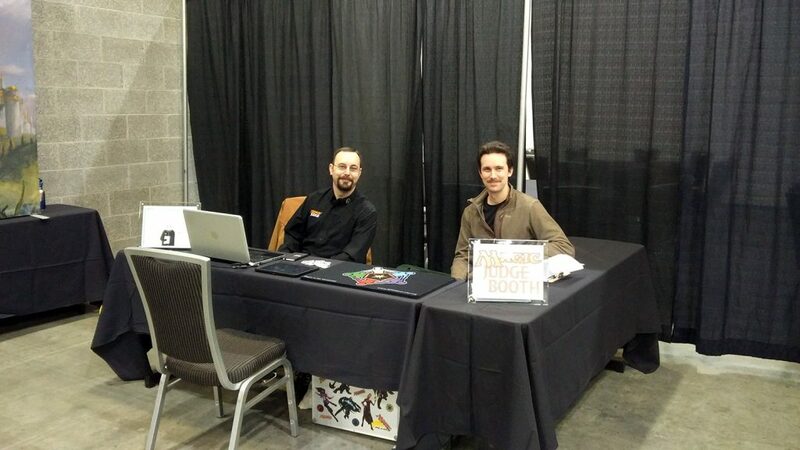 I ran the event by myself for the three days of the GP, with a small amount of help from Callum Milne (L2, Canada and one of the rules NetReps) for the first day. Callum had a good time and even managed to find a question in there that was not correct. The people that run the Project were able to fix the question very quickly, which is a huge advantage of having an online system. Good times were had by all. I had quite a number of European players come by and tell me how much they love Judge Booth. North American players on the other hand didn’t know what Judge Booth was at all. I had to sell the idea of Judge Booth to them, but when they found out I was giving away prizes they were much more interested. I basically sold them that Judge Booth is a Gameshow where Judges pretend they are Players and Players pretend they are Judges. I think, if we (as North Americans) put on Judge Booth more often, players will more receptive. Newer players loved it whereas experienced Tournament Players were tepid. I had one player who kept coming back to the booth. Over and over and over and over. Between rounds, at the end of the day etc. He probably spent close to 6 hours at the booth over the whole weekend. I had lots of repeat players, but after the initial visit it was just a really nice place where they could unwind and chat with other like minded players and myself. My biggest take away is that Judge Booth is a great recruitment tool for the Judge Program. I helped facilitate testing of two brand new L1 Judges (who both passed). I had Sophie Pages (L3, France) come by the booth to check it out. She probably has a lot more experience with Judge Booth than I do, while I was basically running this as a pilot project. Mauro Bongiovanni (L2, Canada – Tournament Organizer) was a bit hesitant in regards to Judge Booth at his GP. I had Jon Goud (L3, Canada – RC for Canada) sell the idea to him. 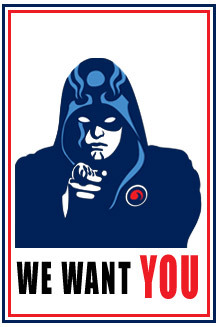 I think the biggest thing to make Judge Booth successful or to be able to host Judge Booths at GPs in North America is to sell the idea to the Tournament Organizer and have them know that it should be strictly a Judge Program Community endeavor and that Judge Booth does not take away from the profitability of a Grand Prix. From my estimation, it did not. I would have liked to have Judge Booth open for longer, but as it was basically just myself and I ran it from 8-9 AM to 5-7 PM depending on how exhausted I was and how many people were coming through. I feel like I missed out on some players that would have been interested but they may have otherwise been preoccupied with events. Overall, I think Judge Booth is one of the unsung heroes of the Judge Programme and should be used as a recruitment tool more often at North American GPs.